What a whirlwind this past week or two has been. 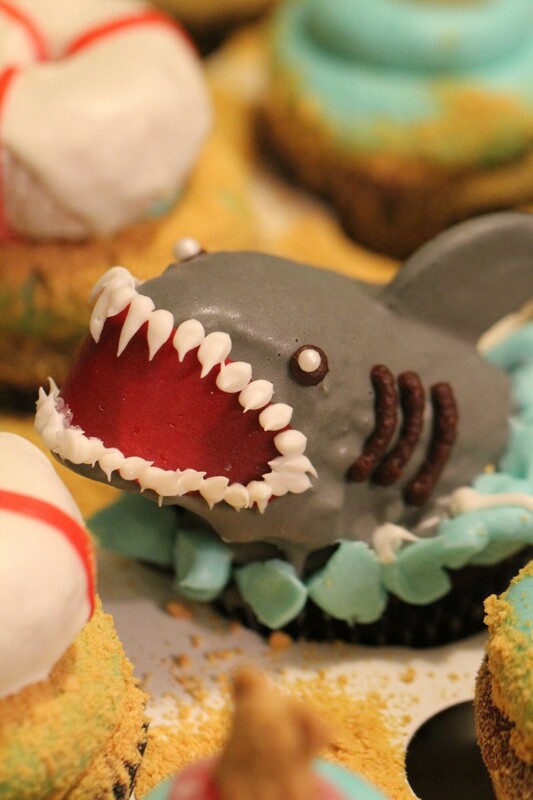 I have made oodles of sweets and treats (the picture above is one of my brain children of these such times) , done so many crazy things, and yet…I have been so rude as to not share my life story with you. Don’t worry, I’m sitting in time out as we speak. So, I’m going to try to catch you up to speed, slowly, but surely. But first, because everyone keeps asking me how Miss Cupcake is feeling. I feel warmth and love of so many people, but I think that I’m going to finally break down and give you the real truth this time. Since June 10 (the night before my birthday), I have been feeling pretty much like crap. I have an upper stomach cramp/pain that doesn’t want to go away, I feel bloated and nauseous daily, and I can’t seem to eat much of anything…and DEFINITELY not any of my lovely sweet thangs…which I miss so much. A Hida Scan, if that is even how you spell that wretched thing. That wasn’t really a big deal, aside from the fact that they shot radioactive dye through my system for two hours straight. Splendid fun. A strange and “palm reading” like experience with a “natural” health lady. She gave me the lovely opportunity to take 5 supplements a day, each smelling and tasting like a different brand of dog food. Mmmm…variety. A visit with an internal medicine doctor. And last but not least, no answers…except that I’m not pregnant. So, pretty much, the last almost three months have sucked. But, you know what? I’m thankful for them. I have been able to learn and appreciate people who suffer from pain. I have also been able to worship God in an amazing way. Coming from a girl who has such a blessed life and not many trials in her life, this sickness really put me on a humbling level. I have never sang the song “Praise You in This Storm” more passionately. I praise God for blessing me with health and I will praise him even though he has taken it away for the moment. I’m learning to appreciate my mother for all she does, for the side affects of the medicines that she takes, and learning to be less sarcastic with her and more loving. I’ve learned that pain is not easy or fun to deal with, but it is what you do with what you have that makes you are. I, my friends, would love to be known as a fighter. I want to push myself to try and do things even if I tell myself that I’m tired or don’t feel like it. I’m praying for the cure, but I will continue to praise him in the storm. So as of now, I’m in “maintenance stage.” After seeing the internal med doctor (who also happens to be the father of the children I nanny for), he gave me several different meds. He told me that I just needed to hang on, but he could give me a few things that would help when the pain is extremely unpleasant. I need to eat pretty bland, and take the skins off of fruits. So, pray, pray, pray this doesn’t last too long, as school is starting on Monday, and I would LOVE to be myself again, eat ice cream every night, and go on dates with my charming prince. Bake for about 12 minutes, or until lightly golden brown on the bottom. They might look a bit undercooked. DO NOT BE ALARMED! Take them out, they will continue to bake on the warm sheet. Transfer to cooling rack after 1 minute. Prepare the chocolate cookie dough by combining cake mix, oil, and eggs until mixed. Roll into 1 1/2 inch balls, set on cookie sheets, and press down with your palm until 1/2 inch thick. Bake for about 10 minutes. Take cookies out, cool for 1 minutes on sheets. Transfer to cooling racks. Take one graham cracker cookie and one chocolate cookie, put a TBS. of marshmallow creme in between two cookies, squeeze down, and roll in graham cracker crumbs and Oreo crumbs. Wrap in cling wrap immediately. If not, the cookies will do the marshmallow creme slide. 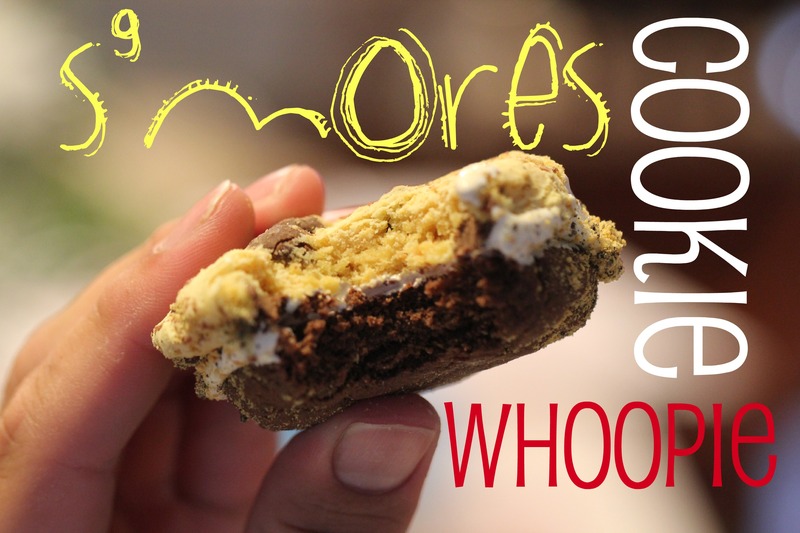 Along with these s’more whoopie cookies, I came up with this lovely idea for a s’more without the mess, called campfire cookies. Don’t worry, I’m not a s’more hater, I just have a problem with stickiness getting all over my hands. Because next thing I know, it’s in my eye (because I have an itch), then it’s in my hair (because I’m constantly fixing my bobby pins), then, next thing you know, I’m glued together..literally. It’s happened. So, I decided to be kind to myself, and make myself a cookie that is inspired by all of the poor dysfunctional s’more eaters like myself. Behold. 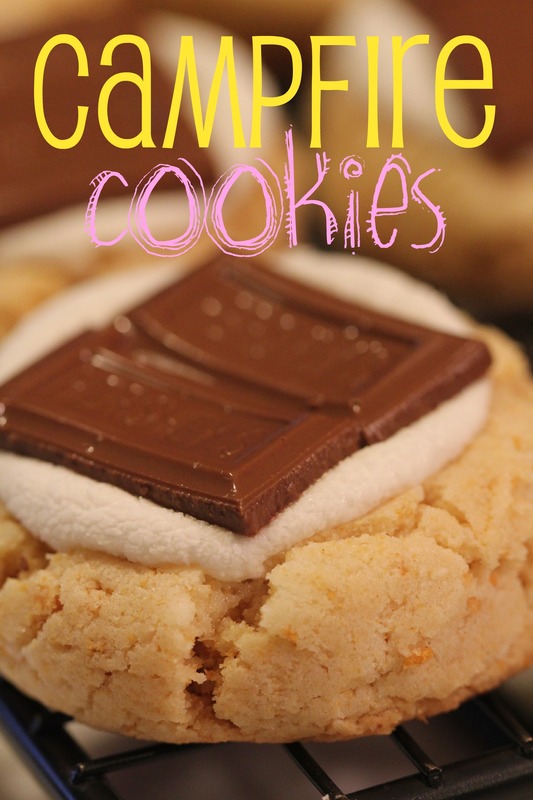 Campfire Cookies. 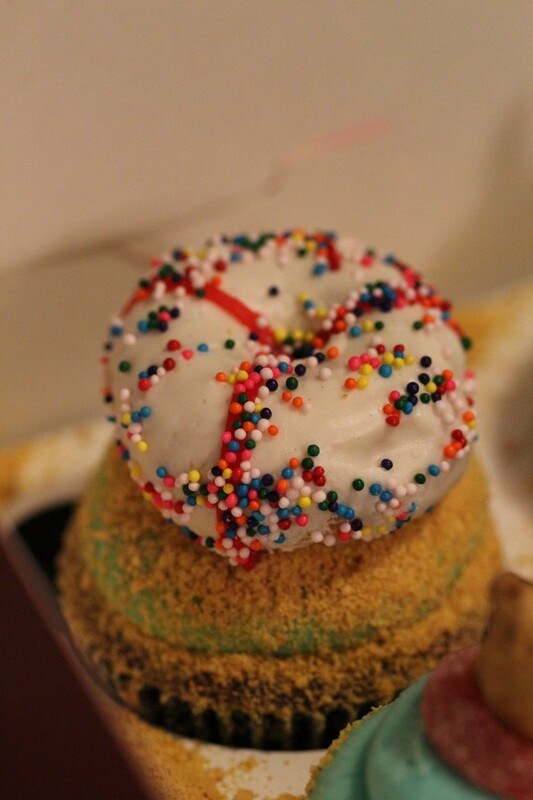 Combine cake mix, oil, eggs, and graham cracker crumbs with an electric mixer or by hand until mixed. Using a cookie scoop (or rolling into 1 1/2 inch balls), place on ungreased cookie sheet. Do not push down! Bake for 12 minutes. Pull out of oven for a moment, Push 1/2 a regular size marshmallow down so the cookie starts to crack on the sides (like a pb blossom). Let bake for 3 minutes more. Take out of oven. Break Hershey bars into single pieces. Place two pieces on each cookie. 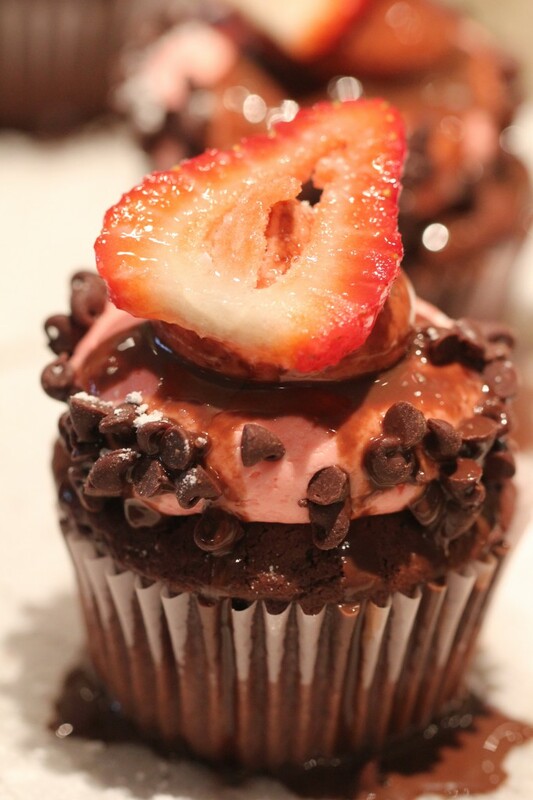 Enjoy while warm and gooey or wait and store them in an air tight container. Also, I had a lovely little order from my bestest friend in the whole world, Torey Reichenbach. She was having a lifeguard party and told me to use my creative energy. MUAHA, that, my friends, is a dangerous thing. 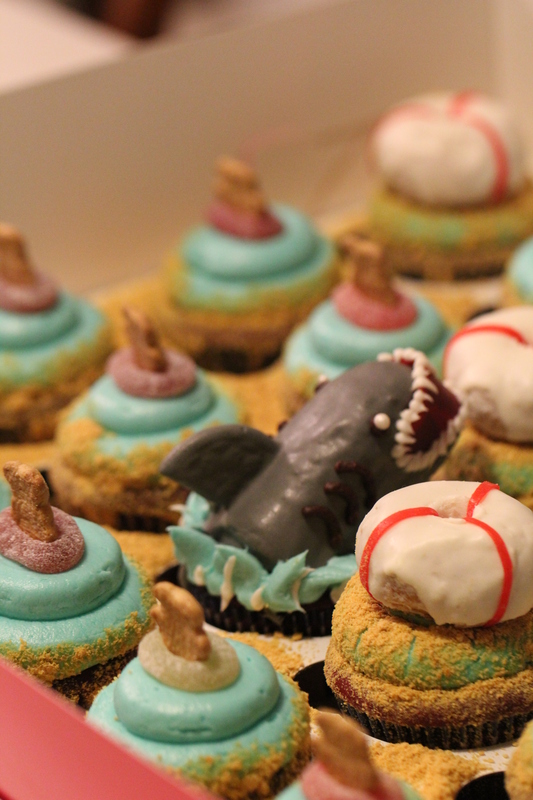 So, I thought that I would create the most obvious thing for a bunch of lifeguards…SHARK ATTACK cupcakes. Also, because they are lifeguards, I thought that I would include life preservers…just in case it got violent in that box. 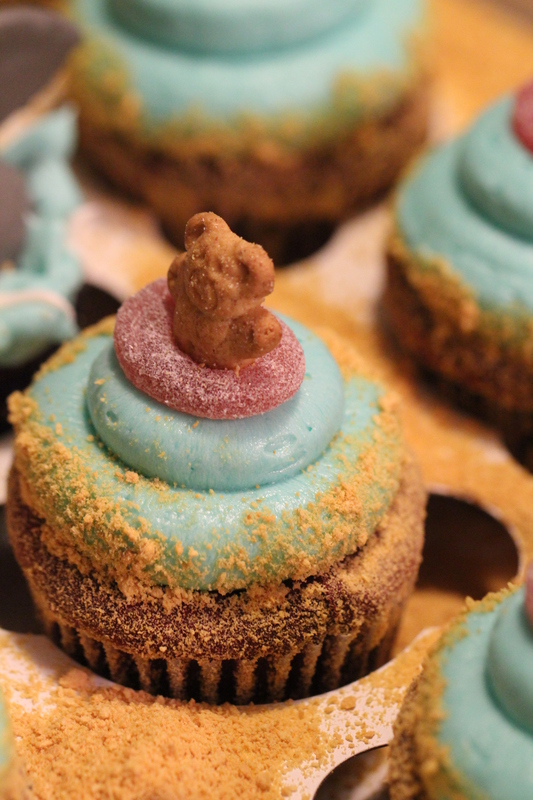 Then I created this delicious “collection” cupcake package. 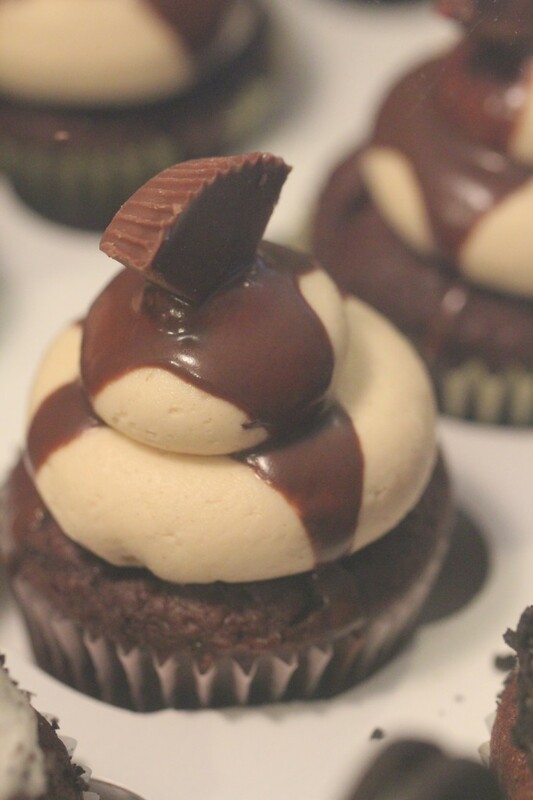 I call it the Oreo dipped in peanut butter collection. 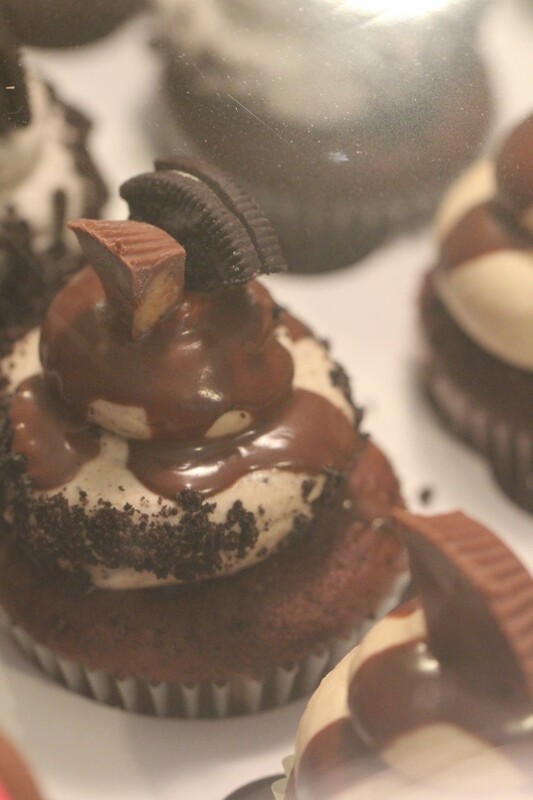 Half of them were chocolate fudge with pb butter cream, fudge dip, and pb cup and half were chocolate fudge with Oreo butter cream, chocolate cookie crumbles, and an Oreo. 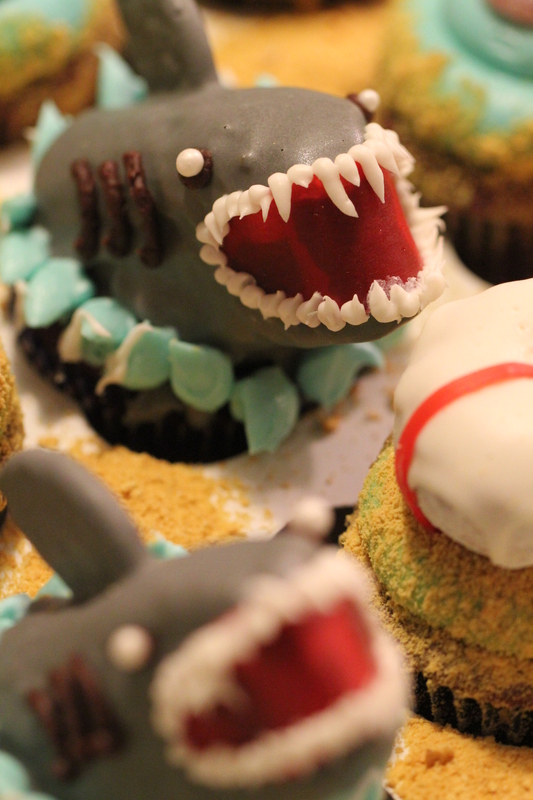 Then, I combined them into a few cupcakes….genius. I hope you LOVED them Meg and Keith! 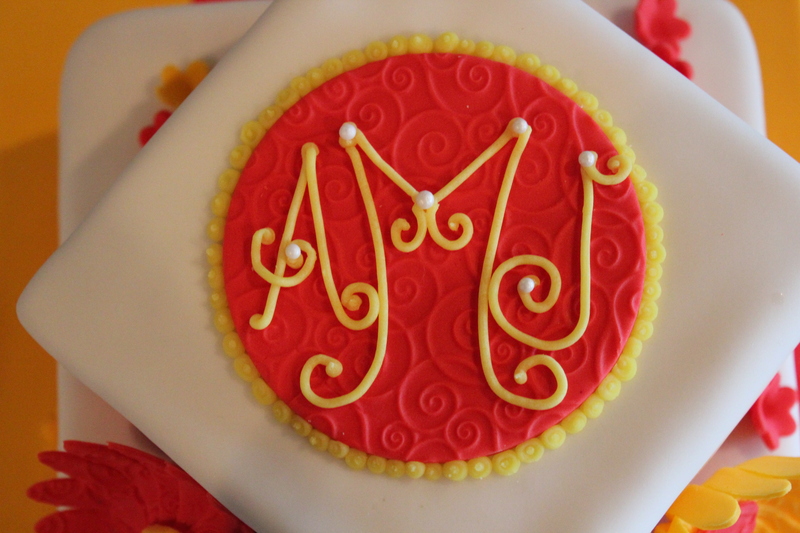 Specially ordered for you by my lovely grandma! We all love you so much and are praying for you to get better Meg! 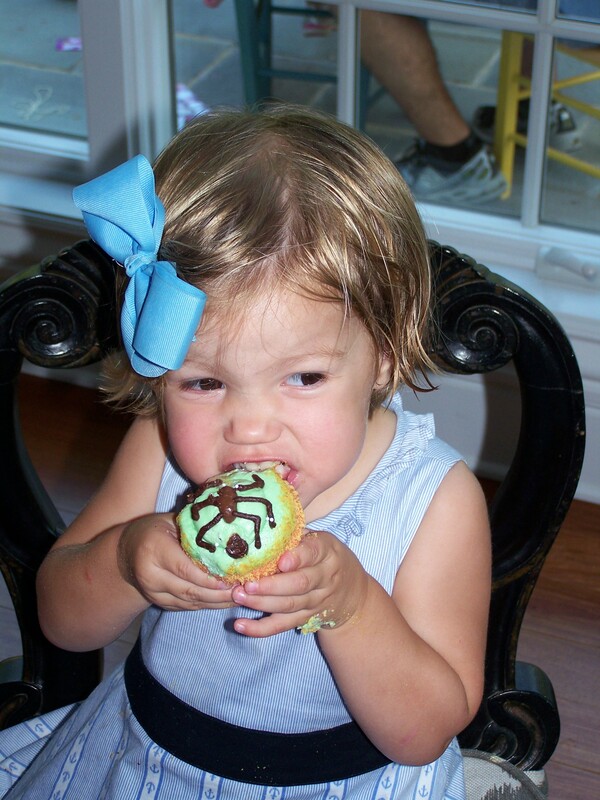 Oh yes, more cupcake fun. These were created for a baby shower. The left is my new chocolate covered strawberry cupcake and the bottom is my lemon crumb cream (filled with lemon pie filling..yum). I heard that there were not many left. 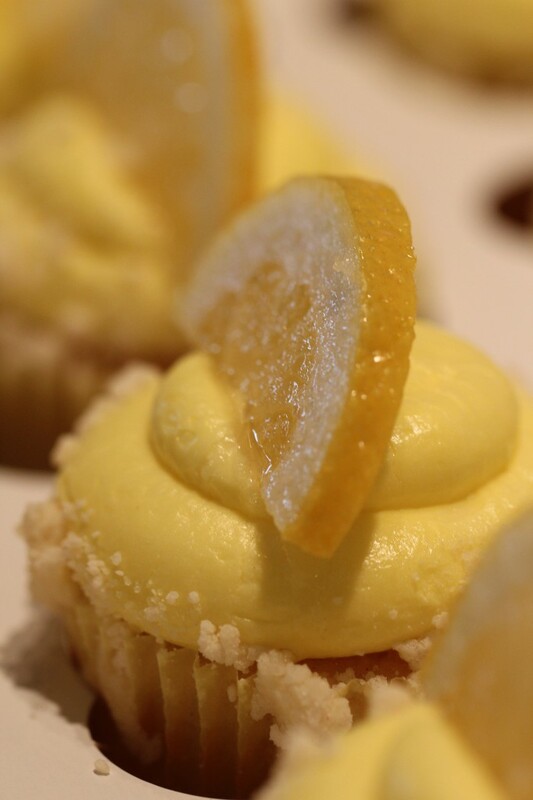 Do you think these look yummy? Maybe it is time to order some of your own Miss Cupcake cupcakes! 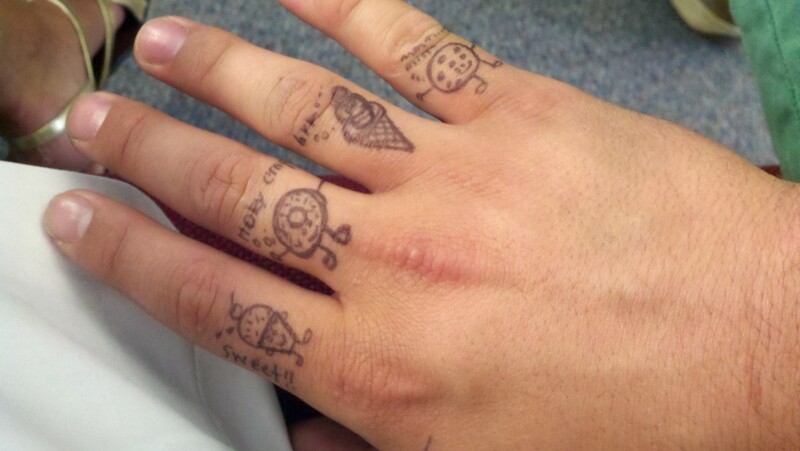 Then, I decorated Jared’s hand during church…because I can. 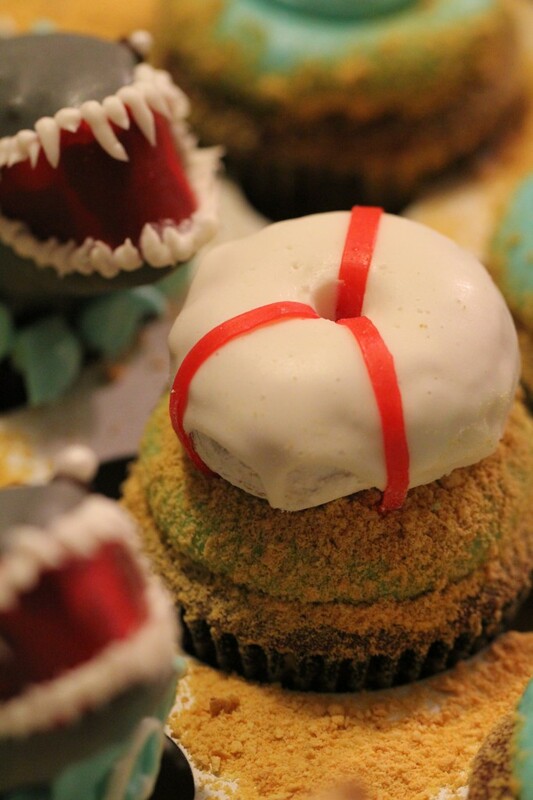 I made these picnic and ant themed cupcakes for my cousins Palmer’s birthday party. Wow. That is all I can say. There was a nature center lady with an opossum, an angry Palmer who poured her water dish on her dog and stepped into in it, and of course…. lots of screaming children. 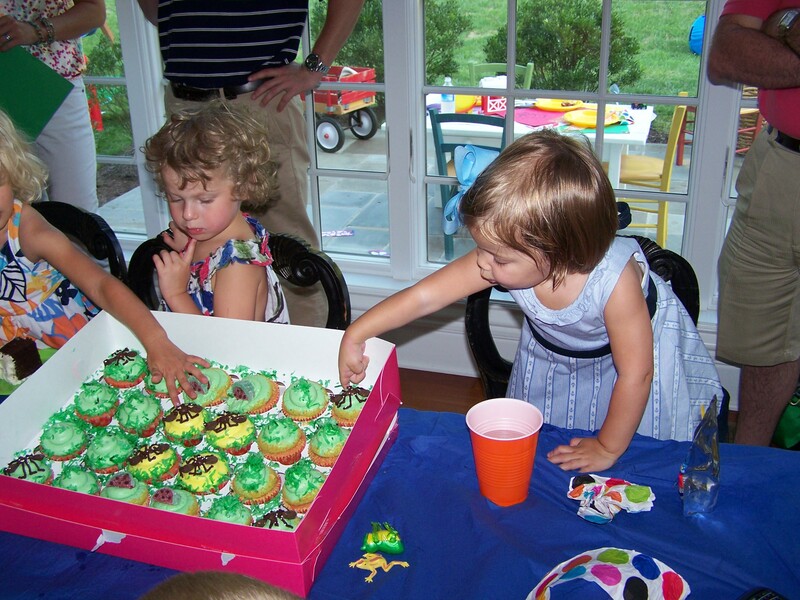 However, despite the distractions, I took the time to watch my cousin Mary Catherin enjoy one of my cupcakes. It’s a beautiful thing. That is why I do what I do. Other than the fact that she looks constipated in this picture, she thoroughly enjoyed it. 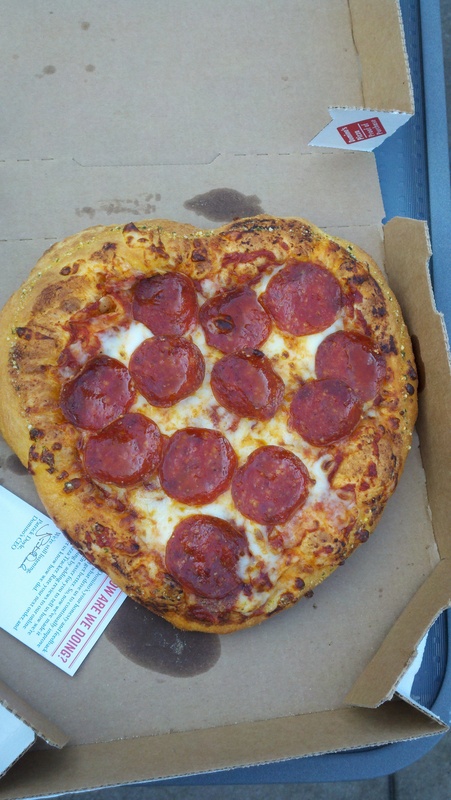 And then there was the heart pizza for my dream man. Let me break it down for you. Me: Mr. Domino’s Man, can you make that into the shape of a heart? Domino’s Man: Are you the girl who ordered the heart pizza? Me: Why yes, yes I am. Oh…by the way…I’m not pregnant.